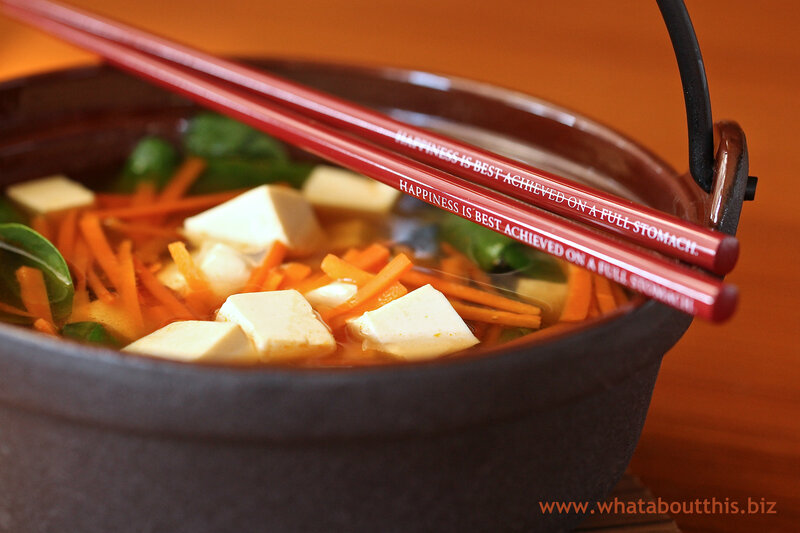 Hot and Sweet Vegetable and Tofu Soup | What about this? After nearly two months of holiday gluttony, I longed for a soothing and nutritious soup. With its balance of spicy, sweet, and sour, this soup fit the bill. Simple to make and delicious to eat, this soup took the chill off of a cold winter day. Some recipes transcend their basic ingredients and this is one of them. 1. Heat the stock in a large pan, then add the red curry paste. Stir constantly over medium heat until the paste has dissolved. 2. Add the lime leaves, sugar and soy sauce and bring to a boil. 3. Add the lime juice and carrot to the pan. Reduce the heat and simmer for 5 to 10 minutes. 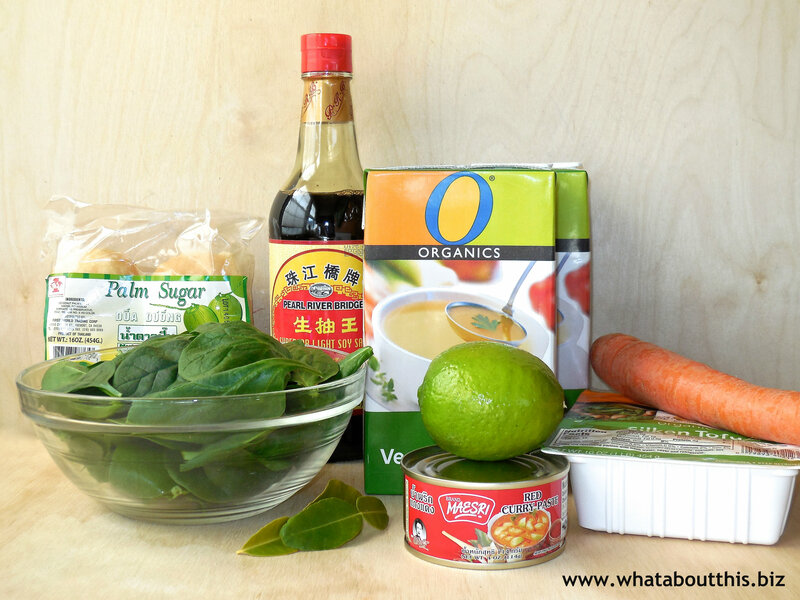 Place the spinach and tofu in four individual serving bowls and pour hot stock on top to serve. 1. I used only 1 tsp of the red curry paste. The soup had a mild curry flavor and a bit of heat which was just right for me. My family likes spicy food, so if I were making this for them, I would add more than the 1 tsp of curry paste. Made from the sap of the coconut palm or the sugar palm tree; palm sugar varies in colour from golden to light brown. It has a distinctive flavor and is not so sweet as cane sugar. It is often sold as a solid cake. If this is the case, grate it before use. 3. Kaffir lime leaves are green, glossy, double leaves that have a fragrant citrus oil. They are aromatic and lend an amazing flavor to soup. There is no substitute for them. Purchase these leaves fresh at an Asian market or, perhaps, ask your local Thai restaurant if they will sell you a few. 4. Silken tofu has the delicate consistency of egg custard, so it must be handled with care. If handled roughly, it will break apart. 5. To make this soup heartier, you can add mushrooms (straw or quartered button mushrooms), prawns, and/or noodles. Peel and devein the prawns, leaving the tail segment intact. Add prawns to the soup about 5 minutes before serving and cook them for 3 minutes or until they are firm and pink. If serving with noodles, it is best to cook the noodles separately and add them just before serving or place them in a soup bowl with the spinach and tofu and pour the hot broth over them. By doing so, you are preventing the soup from becoming cloudy and thick. Thanks Didi! I got these chopsticks from Pottery Barn several years ago. They came in a set that included 7 other sayings.